Publication details: Book. 2013. xv and 561 pages. Publication date: 2013-04-02. Hardbound, richly illustrated in full color. Inspired in part by Blodi's (1986) volume in the Hirschberg History of Ophthalmology series dealing with postage stamps depicting ophthalmologists, related scientists, medical researchers, and the eye in general, we have sought to create a work that will be of use not only to those with interest in the medical and optical fields, but also to numismatists. In general, we have followed Blodi's arrangement and topics, so that users of both volumes will be able to readily compare similar subjects across the two media. Like Blodi, we have been broad in our selection of topics, hoping to incorporate as much of the wide range of material relating to ophthalmology, its history, organizations and practitioners, including scientists whose impact on ophthalmology and optics was significant; optical firms and opticians; those who have lost total or partial sight and their rehabilitation; and, of course, the eye in its many symbolic and mythical uses. Casting the net wide in this way, we have captured a sizeable body of numismatic material. Generally, we have tried to be as inclusive and complete as possible, so that, for example, chapter I on ophthalmologists includes every object on this subject that we could locate having searched private and public collections, and a range of publications. This same level of inclusiveness holds true for chapters III, V, VIII, IX, X, XI and XII as well. Where the subject matter itself is vast, such as in the case of celebrity scientists, like Benjamin Franklin (inventor of the bifocal lens), in chapter IV, or in objects pertaining to the eye as a symbol in chapter XIII, we have exercised judicial exclusion, selecting items that best represent the subject or that are numismatically important. The same case holds true chapters II, VI, VII, and XIV. Within each chapter the subjects are arranged chronologically unless otherwise noted. Each subject has a brief biography or description, followed by a catalogue of items. The catalogue information includes the issuer and/or mint, physical features, and detailed descriptions of what appears on the obverse and reverse of the object. With only a few exceptions (as noted), all the catalogued items are illustrated at or approximately 1:1 scale. Because a number of the individuals and organizations discussed here appear on multiple items appearing in different chapters, we have adopted a numbering system for each item that allows for easy (cross-) referencing. Items are numbered sequentially within each chapter, so that the fifteenth item in chapter II, for example, is numbered thus: II.15. Also, because so much of the material presented here was produced by engravers and sculptors of note, many of whom achieved considerable prominence, we have included biographical information for the artists as well. This information can be found below the catalogue description of the first item by that artist within the volume. So, for example, information about Augustus Saint Gaudens is found at IV.93. An index of artists can be found at the back of the volume. This volume includes a considerable range of numismatic material, including coins, tokens, medals, and paper notes. We define coins as stamped metallic objects produced under a recognized political authority and that are intended to serve primarily as official monetary instruments. Tokens, on the other hand, are privately produced and often serve commemorative, propagandistic or advertisement purposes. However, because of occasional shortages of coinage, especially low value coinage, tokens were at times used as monetary instruments as well, as was the case in Britain in the seventeenth to nineteenth centuries, and the United States in the nineteenth century. Similarly, paper notes today are generally official monetary instruments produced under recognized political authorities, but at times there have been notes privately produced, whether by banks or communities, that achieved widespread monetary circulation. As with the notes, there are some grey areas between coins and tokens. Many modern governments, for example, produce series of commemorative coins that are not necessarily intended to circulate as monetary instruments, but are rather offered for sale to collectors to commemorate certain events or individuals. Medals, on the other hand, often improperly called "medallions", are never monetary instruments, but rather serve commemorative or artistic purposes. First appearing in fifteenth century Italy, the earliest medals were cast medallic portraits loosely based on Roman sestertii, a type of large diameter bronze coin featuring portraits of the emperors. As the medal evolved in the sixteenth and seventeenth centuries, new production techniques, such as striking rather than casting, and metals, such as silver and gold, were used. By the nineteenth century, the medal had evolved into a distinct art form as was recognized as such at some of the major European art schools, like the École des Beaux Arts in Paris, where medallic art was taught as a separate subject. No longer simply commemorating events or people, medals now were presented in rectangular or other formats featuring scenes of daily life no differently than contemporary paintings. Always linked to sculpture, the medal, following the Second World War, underwent similar reassessments of its form and function so that today many (art) medals bear little resemblance to the coins that first inspired them. Additionally, the term "medal" often refers to award decorations because the earliest of such items were little more than medals hung by a ribbon. Given the commemorative function of so much numismatic material, as well as the popularity of medals in previous centuries as a comparatively inexpensive and durable portrait or propaganda medium, individuals, organizations, and events related to the medical arts have been well represented in numismatics. Often these items have been commissioned by, for example, the students and/or colleagues of an individual to mark a milestone in his or her career, or by organizations for use as awards and for meeting souvenirs. For those who have achieved great prominence in their field, their likeness may be included in special series of medals commemorating, for example, great surgeons or medical scientists. Because of this general abundance of medicina in nummis (i.e., numismatic items pertaining broadly to medicine), there have been a number of important collections put together by physicians or surgeons that have sought to gather all medically related numismatic items or portions thereof. The most notable of these are the collections of Dr. Horatio Robinson Storer, now held at Harvard University, Dr. Josef Brettauer, now held at the University of Vienna, and Dr. Henry Barton Jacobs now held at the Evergreen House (Johns Hopkins University). As part of his numismatic pursuits, Storer produced a catalogue of his collections, which was edited and published by his son Malcom (1931). Brettauer's collection was catalogued by E. Holzmair (1937), while the Jacobs' collections, along with that of several other medically related numismatic items donated to Johns Hopkins, was catalogued by S.E. Freeman (1964). However, due to the costs of photography and printing comprehensive reproductions of numismatic items was prohibitive until relatively recently. For this reason, these important catalogues illustrated only a small fraction of the items listed or discussed, which sometimes has led to confusion. Since the ability to see the object is often as important as a description of what appears on it, we have, with only a few exceptions, illustrated all items we list, including many not illustrated in the catalogues of the Storer, Brettauer, and Jacobs collections. These three catalogues remain the most important references for medicina in nummis, but in recent years they have been greatly augmented by other catalogues and studies to the point that a comprehensive bibliography for the subject, compiled by Hubert Emmerig (University of Vienna, Institut für Numismatik und Geldgeschichte), now runs to over 60 pages. Sub-specialties within medicina in nummis have developed reflecting the many sub-specialties within medicine itself. Of these, ophthalmologia in nummis, while recognized by Storer and Brettauer, was the dedicated focus of Istvan Györffy, a Hungarian ophthalmologist, whose collection of ophthalmology-related coins and medals now resides in the Semmelweis Museum. In a series of articles published in the 1970s, Györffy catalogued and discussed portions of his collection, bringing to attention the large number of ophthalmology related medals produced in Hungary and other eastern bloc countries (before and) after the Second World War. Indeed, as a cursory glance at chapter I reveals, few other countries have been as prolific in ophthalmological numismatics as Hungary, which in general also reflects the importance of the medal in (post-war) Hungary as both art and commemorative object. In addition to Györffy's work, we have also expanded upon the work of others, like Albert von Pflugk, an ophthalmologist of Dresden, who was an avid collector of spectacles and visual aids of all kinds, and so amassed a collection of numismatic items depicting spectacles, which he catalogued in 1921. 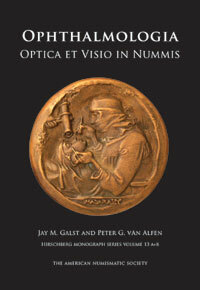 Thus, while inspired by Blodi's (1986) volume in the Hirschberg series, our volume, Ophthalmologia, Optica & Visio in Nummis, also stands in within the Storer-Brettauer tradition (it should be noted that one of the authors, Jay Galst, is a practicing ophthalmologist and numismatic collector), and expands greatly upon the work of Györffy and others. While items from Jay Galst's extensive collection of ophthalmological numismatics are featured here, we have also been able to draw upon material from the Storer, Brettauer, Jacobs, and Györffy collections, in addition to numerous other public and private collections. For this reason, we have incurred a substantial number of debts over the years and so wish to thank a number of individuals and institutions for their considerable assistance in assembling the material presented here. For opening their collections, including, in some cases quite literally "opening" encased award medals, we thank especially Paul Aangenendt, Jenny Benjamin, Hubert Emmerig, Neil Handley, Andreas Hoop, Reva Hurtes, the late Robert Machemer, Alan McBrayer, Ira Rezak, Bruce Spivey, and the late Ralph Sonnenschein. It is regrettable that Ralph passed away just as this book was ready to go to press. The Sonnenschein collection of medals has been bequeathed to the University of California, Los Angles, Louise M. Darling, Biomedical Library's History and Special Collections department. Several institutions have been enormously helpful in making their collections available to us, including the Bascom Palmer Library, the Museum of Vision, the American Numismatic Society, Evergreen House (Johns Hopkins University), Bibliothéque Nationale de France, the British Museum, the British Optical Association Museum, the Semmelweis Museum, and the Brettauer collection of the University of Vienna. In addition we would like to express our gratitude to David Abramson, Bernth Ahlstrom, Michel Amandry, the late David Apple, Anne Bentley, Paul Bosco, Benjamin Boyd, Jay Enoch, Andrew Ferry, Haim Gitler, Robert Heitz, Charles Letocha, Mashiko, Laszlo Nudelman, Alan Stahl, Bradley Straatsma, Ben Swanson, John Tull, Jacques Voinot, and the late Jacques Willemot. We thank as well Jerome Abrams, Daniel Albert, David Alexander, John Bigger, Michael Brennan, Catherine Bullowa- Moore, George Z. Carter, George Cuhaj, David Fleishman, the late F. Gordon Frost, Dunbar Hoskins, Jonathan Kagan, John Kleeberg, Gordon Klintworth, Douglas Koch, Linda Lawrence, Ronald MacGregor, Walter Marshall, Stewart McIntosh, Alice McPherson, Scott Miller, Luc Missotten, Normand Pepin, James Ravin, Gabriel van Rij, Robert Sacks, Aichem Schramm, Stefan Seregard, David Simpson, Bruce W. Smith, the late Stephen Tanenbaum, Dr. Vascellari, George Waring, Frederic Withington, and Vicken Yegparian. The following institutions readily helped in providing material: Alcon Eye Museum, Children's Eye Care Foundation, ESCRS, Israel Museum, Leu Numismatics, Macula Society, Massachusetts Historical Society, Medical Museum of Lyon, France, Musée Cluny (Paris, France), National Gallery of Art, Kress Collection, National Museum of Denmark, New York Eye and Ear Infirmary, Stack's Rare Coins, UKISCRS, and Zeiss Optische Museum (Jena, Germany). Over the course of our numismatic and ophthalmological historical research, there have been mentors and colleagues who have not lived to see this volume to completion, but who have been instrumental nonetheless. Among these we include Frederick C. Blodi, Michael Druck, Henry Grunthal, and J. William Rosenthal. For their work on processing the photographs that appear in this volume, we thank Alan Roche and Anouska Hamlin. Special thanks go to the American Numismatic Society and the kind assistance of its staff including, Ute Wartenberg-Kagan, Andrew Meadows, Robert Hoge, Elena Stolyarik, Muserref Yetim, Elizabeth Hahn, Frank Campbell, Sylvia Karges and Rick Witschonke. We are particularly indebted as well to the publisher and editor of the Hirschberg ophthalmic history series, Jean-Paul Wayenborgh, for his continued enthusiasm and support of this project from its inception. Jay Galst also thanks his son David Galst whose independence and ability to move out of our home and competently handle life on his own, gave Jay the time and space to undertake and complete this project. Galst also thanks his mother Phyllis Galst and his late father Julian Galst for stimulating and nurturing his lifelong interest in numismatics. Finally, it goes without saying that a project of this size would not have been feasible without our wives, Drs. Joann Galst and Muserref Yetim. Over the course of seemingly endless days, evenings, and years, they have been unwavering in their love, support and patience, both helping and encouraging us to see this project through to completion. Our dedication of this volume to them can be only a small token of our appreciation and gratitude. We also hope that readers will take as much pleasure in reading and using this volume as we have had in writing it. This is a volume born of good company, collegiality, and friendship.